Fixed windows prices can range from $115 to $650 - this price includes both the installation and the window itself. Fixed framed windows don't open, but are visually appealing and can be quite stylish and a welcome addition to any home. They often provide great sightlines and allow lots of light into a room. Entry level fixed windows usually come in an inexpensive vinyl frame and can be purchased from any of the larger retail stores, including Lowes or Home Depot. This level of product will usually include a low end glass package, a limited range of frame finishes and color options, plastic hardware and limited or no upgrades on the frame. The mid-range fixed windows come in a choice of frames from PVC or composite to a high end vinyl option. In many cases, they will include a double pane glass choice with some nice energy efficient upgrades. These can be the top of the range windows from a basic manufacturer or they can be the low end options from one of the top window manufacturers. 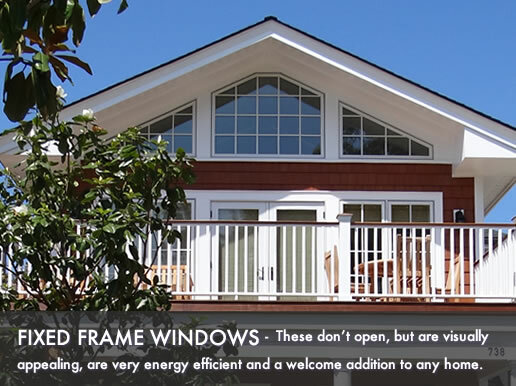 Higher end fixed windows come in a choice of frames, including wood clad, aluminum and fiberglass options. They are generally available from the top manufacturers such as Pella, Marvin or Andersen. These fixed windows usually include a triple or double paned low-E glass with foam insulation and argon fill, excellent hardware and upgrades. The cost to install a fixed window will vary from $40 to $200 per opening. If you need a basic insert or replacement, the price will fall in the $40 to $75 range. If more extensive work is required (jambs and sills need work or the frame needs reinforcing), you can expect to pay closer to the $250 per opening mark. For additional pricing, use the replacement window cost calculator. Low end window costs start at $115 and top out at $250 for each installed unit. Mid-range window costs start at $250 and top out at $450 for each installed unit. High end window costs start at $450 and top out at $650 for each installed unit.